Per the new enforcement announced at the link below the MT has begun accepting complaints for double/multiple chasing. This topic is being created for such posting. Please remember that we need evidence to verify the claim to be posted publicly. If you have setups to block out, you are welcome to do that as long as the essential event you are complaining about is still clear. Hi, i report player "celtic rule". but it was actually a double chasing. I think a case has been opened but i did not get any answer yet. Here is the link to the screenshots. Yes the case is opened, we are just waiting for another vote to reach a majority, should be soon. A case will be opened. This is a very interesting triple chase case and should arrive very instructive to everyone on the site about this issue of double/multiple chasing. Thank you for posting it, Angelos353. Yes thanks for posting Angelos353. I do wonder why you did NOT include that you were in Draw Refusal when you reported me-CR ? I did request that you include this IF you were to report this match. As far as I can see it is in chat at the beginning of your video. I myself deleted my video due to no claim being made yesterday-- My Mistake ! MT CR was playing under draw refusal rules . I still fail to see how my opponent progressed game/match with out attacking ? They were the one to decline 2 draw requests. I agree Angelos353 should get pts back that is all !!!! I choose to see this as a draw. I could have just rolled back and sat on FLAG with superior pieces. Having exchanged one of the miners. I noticed this yesterday( discussion about this rule and test run of it) and feel it has merit in this case. I tried to add comments by Notrom , The Prf.,Wog, and Napo1 from the discussion on this but was blocked-images to large but most can refer back to and see a variety of opinions on D/M chasing. There was a lot of discussion about D/M chasing I will not add more to it other then to restate my opponent was in Draw Refusal First before this situation occurred.I have posted that MT has a difficult job and am pleased they are here whether cases go my way or not. The only other evidence that I may have are the note I sent to Angelos353 about match and their draw refusal . I also reached out to a few and asked their thoughts on match/circumstances they seemed a bit confused as well as myself. I see CR shuffling back and forth not much chase. NO intervention by site all moves getting no error message and waiting for my opponent to progress match per rules. Since I noticed an ex-MT member having an issue with draw refusal maybe rules are not that clear ? Where is Mr. Tim when ya need him ? LOl---- That's my side of the coin you guys--MT/Communinty . I would add an ex-player suggested I contact customer care and ask for CR acct be shut down/deleted. Thus Angelos353 not receiving their or my pts. After I got done laughing about this I told the ex-player I was not ready to pick up my ball and go home-yet ! I did mention to the ex-player that when I was working in Education it was a tactic parents/guardians would use to keep the student from having an expulsion/suspension on their record. A bit extreme I feel but folks like to work the rules or angles--human nature maybe ? Edited by rgillis783, 29 December 2018 - 03:16 PM. The thing is rgillis, this game should not be a draw, so Angelos has the right to refuse it. You are not allowed to chase in the first place, so there should be no 10 minutes of no progress. The D/M chasing trumps the draw refusal. Ok LM yes there was no 10 min of no progress it was more like 20 min. Total amount of time for match 40 min.The first place by the way LM was this player not playing hence the draw request. As I have stated I am not platinum player or pro. The rules seem very muddy to this old timer. I have already stated if this pro wants pts deserves pts. you MT members make the call-- This can be seen in video and my earlier remarks in posts--np. You the MT have now set the precedent you can sort it out. As stated if you are correct I should have collapsed my pieces around flag and spent more time then apply for draw refusal case. Better then that -I will march on for the flag. I have noticed that the Platinum players enjoy the dance especially Angelos353 . I will enjoy stepping on their toes every time in the future ! Thank you for your unbiased opinion on the matter . If I understand the rules correctly, they state that double/triple/whatever chasing is prohibited in all circumstances. Because of this, according to the current rules of the website, rgillis783/celtic rule was in the wrong, because he double chased. My personal opinion has always been that double chasing should be allowed only in cases of directly defending the flag, which is exactly what rgillis783 did. If I had my way, that would be the rule. But unfortunately it looks like me, midnightguy, and rgillis are on our own in this matter, so there will likely be a guilty verdict against rgillis in this case. Thank you and LM for ya feedback CR will struggle on ! Keep the vids coming please ! That's remarkable you would recall Midnightguy's position on this, Fairway. You've been here a long time. I used to share this same sentiment years ago, but I fell back to favoring consistency of rules instead. To have an exception for flag defense is just that, an exception, and so the rules become inconsistent with that exception. The other thing is that through playing this game everyone becomes quickly (and sometimes painfully) aware of the Two Squares advantage rule. It is something that is keenly watched for and strived for by all players once they discover it. So now at a point late in the game Angelos353 has succeeded in gaining the Two Squares advantage in not one or even two matchups, but all three. That in itself is a nice accomplishment and part of the game. To make an exception for flag defense is to deny the skill of Angelos353 to gain the 2S upper hand like he did. As for a draw refusal interfering with a double/multiple chasing event, or vice-versa, there is no conflict. No one can double chase their way to a draw. Period. A valid draw refusal will become invalid as soon as the draw requester begins breaking the rules himself by double chasing. A draw request made does not guarantee a draw situation exists. 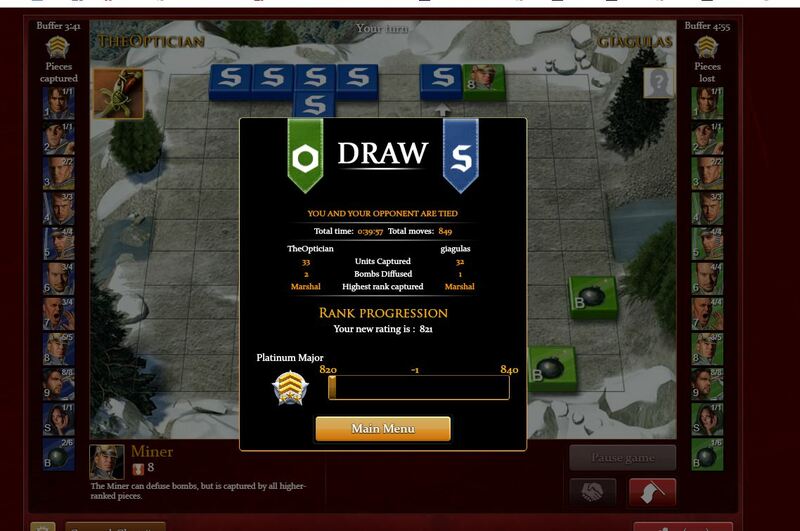 It is only a request of the opponent to acknowledge the draw. If he doesn't, then it's his duty to advance the game. In the case at hand Angelos353 clearly advanced the game by moving his pieces to a point where his opponent was forced to triple chase him. If this is difficult for anyone to understand, consider the following: The aspect that makes double/multiple chasing bad is the same one that makes simple single chasing bad. If rgillis783 only had a single piece versus a single miner of Angelos353 and the latter had the Two Squares advantage on rgillis783, would it be a mystery that rgillis783 would be forced to lose the game? No, it wouldn't. The 2S rule will go against him. Now if the situation is two pieces double chasing two others, why should the chasing player get away with chasing two pieces when chasing even one is banned? What was the verdict in this case? + 25 -25 and the rules explained by letter. The case was closed in mod area 2 weeks ago, but apparently no verdict was posted here. The AR Was made and fulfilled however. I want to report player " 12" (with a space in front of it) for multiple chase and draw refusal. About the draw refusal, I asked him twice to draw, he refused and attacked, no problems with it, but I hadn't draw requests anymore as I used one when it was his turn to play and it deleted... but I guess the video shows it's a clear draw refusal ( I told him in the chat). P.S. I didn't want to spend time on Editing the video, but the flag was in the corner, his lieut was blocking a sergeant, and his captain was blocking a miner and I had a miner and a sergeant ready to move for a sergeant on his side. The vid gives a black screen for me. Perhaps it's not done uploading yet. Will check again later.